Best-selling author and communicator, Ken Davis takes us on a laugh-filled tour through the things that make for real joy in our everyday lives. In the middle of some of the best comedy you'll ever experience, Ken shows us that inside all the craziness of our lives is the real reason for living with joy - because that's the way God intended it to be! One of America's most outstanding speakers, Ken Davis goes far beyond a great comedy-filled speaking style. He's a real communicator who will touch you and your friends. 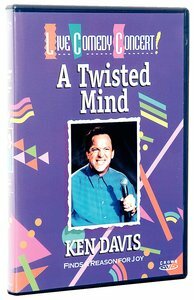 About "A Twisted Mind (Ken Davis Live Series)"
Customer Reviews For "A Twisted Mind (Ken Davis Live Series)"
One of my all time favourite DVDs. On this DVD, Ken Davis chats to young people about how God created everyone special and how we can find joy in our circumstances. A great DVD to watch to cheer your day. I saw this many years ago, and recently bought it for my own collection. No matter how many times you watch it you are sure to have a good laugh. This is hilariously funny, but with a wonderful message as well. I highly recommend watching this and the other Ken Davis DVDs available. I first saw this DVD when I was a teenager. It left such an impression that as an adult I bought it to use it as a ministering tool. Ken Davis delivers the message that God loves us just the way we are and that He created us for a purpose, with humour and joy. I would recommend this to anyone, from youngsters to the young-at-heart! Ken's mission is to share life lessons while making you laugh so hard your teeth hurt! With his unique brand of humour and insight, he looks at three critical steps to knowing God's will and delivers a serious challenge to total commitment. 45 minutes. Much loved comedian and author, Ken Davis delivers an uplifting and humour-filled presentation to encourage Christians in their day to day lives. Mixing laughs with life-changing truths, Ken challenges you to live with nothing to prove, nothing to hide and nothing to lose. As only he can, Christian comedian Ken Davis takes you on an unforgettable laugh-filled journey that explores why he, you, and everybody else is not okay - but loved by God anyway. 60 minutes. Ken Davis offers his funniest material to date during an appearance in the heart of American dairy country. One of America's favourite speakers, Ken offers up a brilliant performance that pays tribute to veterans, explores the differences between men and women, and ponders the question. . . Is it Just Me? Appearing at a beautifully-restored Vaudeville theater in Sheboygan, Ken also shares his disastrous adventure with snow-boarding, his short-lived experiment with weightlifting, and his painful encounter with a nose-hair clipper. His keen sense of comic timing is mixed with a side-splitting dose of physical humour, and the result is a memorable hour of laughter for all ages. No, Ken, it's not just you - we're all a little strange. But thanks for reminding us that we are loved in spite of our shortcomings - and thanks for pointing us to the source of true joy. Ken Davis is a comedian, author, broadcaster. . . and proud grandfather. His radio program Lighten Up! is heard on hundreds of radio stations, and his award-winning books and videos have been international best-sellers. Ken's mission is to share really important lessons while making you laugh so hard your teeth hurt.